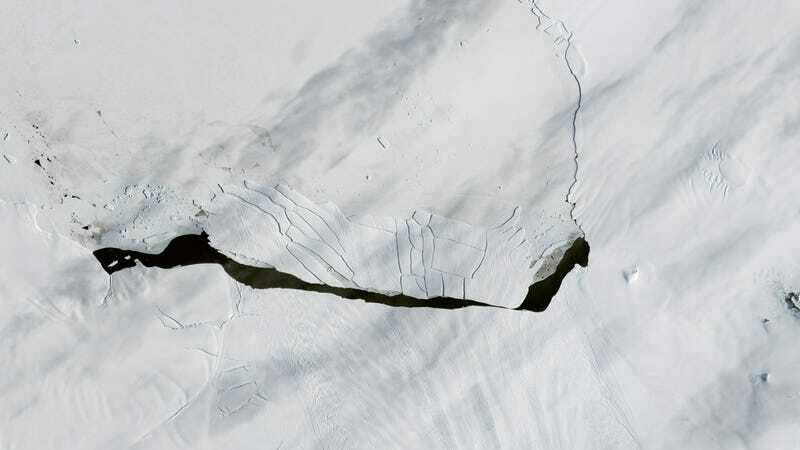 Two months ago, a giant iceberg snapped off West Antarctica’s imperiled Pine Island Glacier. Scientists have been tracking the iceberg via satellites, and they’ve witnessed something rather bizarre. Very soon after calving, the ‘berg began shattering into lots of smaller pieces. Some are interpreting this at yet another sign that the ice shelf buttressing Pine Island—which has been thinning for decades—is becoming perilously weak. 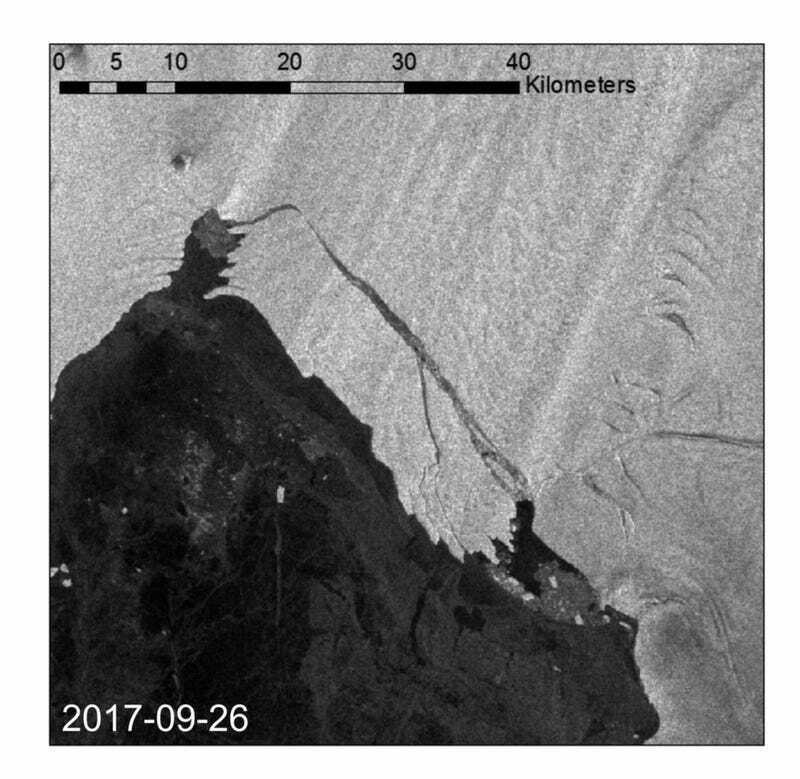 Scientists had expected the 72-square-mile iceberg, first spotted in satellite images in late September and dubbed B-44, to follow the normal course of drifting out to sea before breaking up over several years. Instead, as images released by NASA’s Landsat 8 satellite in October and by the British Antarctic Survey last week reveal, it quickly disintegrated into at least twenty little ‘bergs. The breakup is visually stunning. But for many Antarctic researchers, any change in the behavior of the icebergs snapping off Pine Island—which drains 10 percent of the West Antarctic Ice Sheet, and is the fastest shrinking glacier on the planet—is cause for concern. Researchers are on the lookout for signs that ice shelf’s calving behavior is changing, too. The recent crackup comes on the heels of a study published last year that pinpointed the root cause of the 2015 calving event as a crack that started deep underground and 20 miles inland. “The calving event itself wasn’t a big deal,” lead study author Ian Howat told Gizmodo at the time. “What made this one different is how it got started,” propagating from the base of the ice shelf up, instead of laterally. “My take is that the last two big calving events,” in 2015 and 2017, “have both been anomalous especially compared to the 2001 iceberg that remained largely intact until early 2007,” Christopher Shuman, a cryosphere scientist at NASA’s Goddard Spaceflight Center, told Earther. “Pine Island Glacier’s ice appears to have become increasingly fractured as it has thinned and accelerated in recent years, including the thickest ice in the glacier’s center that forms the floating ice shelf or tongue,” he continued. Glaciers across the world are on thin ice, but Pine Island deserves the special attention it’s getting. Together with its neighboring glacier Thwaites, this vast icy fortress holds back enough water to raise global sea levels by 11 feet.